During your time at work, some of you have been involved in some interesting things. On this page we hope to bring you stories and interesting facts. Richard Cooksley " A Touch of Royalty"
Thanks to Richard for sending in this photograph. 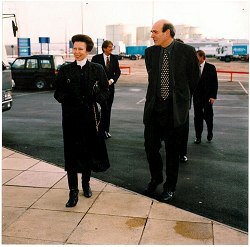 Princess Anne was visiting the Bristol Port Company, a site of successful investment. The photo was taken about 5 years ago when Richard was involved with the companies board. He now runs a company much closer to home from across the yard..